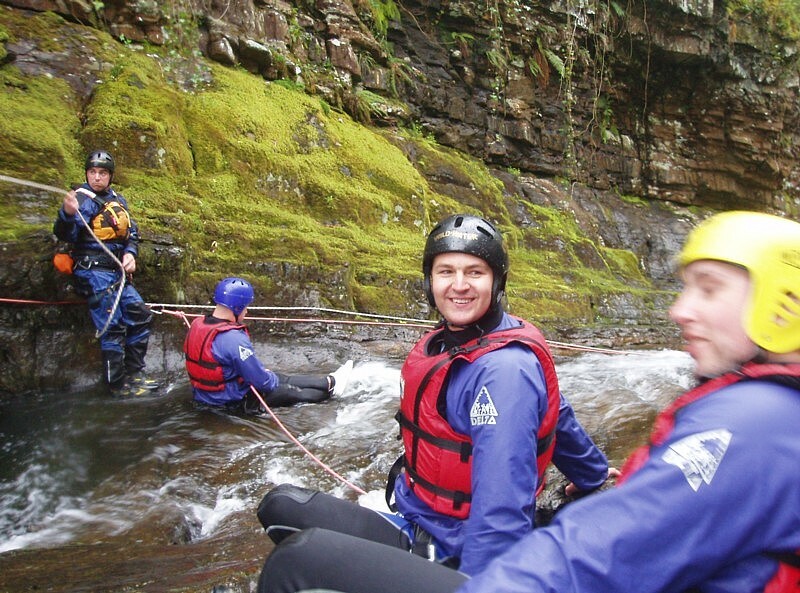 Kitted up in a life jacket, helmet, wetsuit and using ropes in most cases, a guided group attempt to make their way down a river through a gorge taking in all the thrills and spills that nature can throw at you. 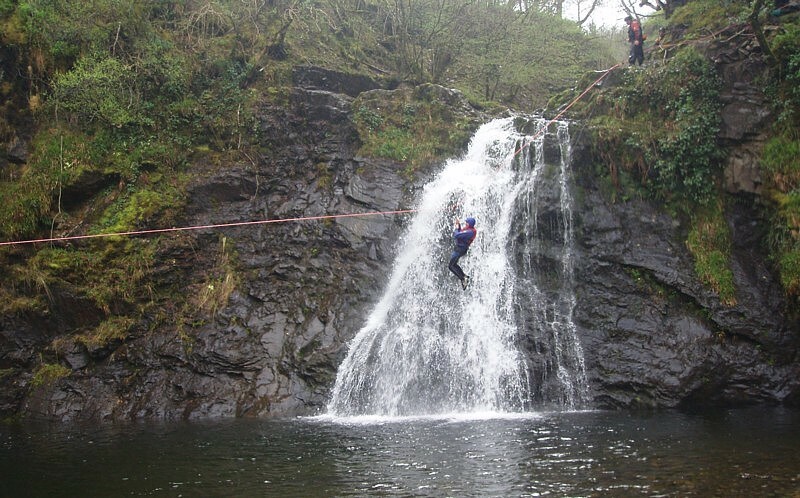 You can expect to explore the gorge in all manners of ways, for example plunging into deep pools, rock climbing, river crossings, swimming and sometimes zip wires. No matter how the guides leads you down, you will get very wet and very pumped! I have been Canyoning a few times, and it’s a great activity to do with friends. Even if you have done it before, try a new place as each has different challenges, and there will be unknown tasks around the next corner to keep you wanting more. 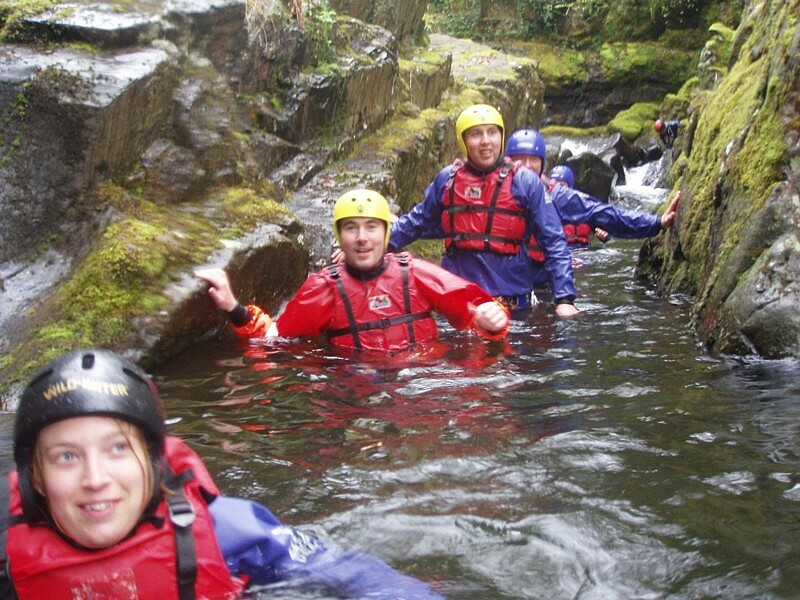 The best Canyoning experience so far for me was a trip with Boulder Adventures in North Wales. It was the first time I had been Canyoning and was a baptism of fire for all concerned. Adrenaline was coming out of our ears! It was my stag do, so we had twelve very excited guys who wanted a good weekend. We had booked some whitewater rafting and the Canyoning was a second choice activity but little did we know it would turn out to be the best of the two! After meeting the guides and being briefed on what we should be doing and who to follow, we made our way up a hillside to the top of the gorge we were to join the river flow and start making our way down. There was no time for messing about as we jumped straight in to the water by a small jump off a rock. It was a little cooler than expected but we were soon laughing and joking and testing ourselves in all manner of ways and egging each other to make the plunge or duck under. The first time we roped in for a steep rocky section was pretty scary as you couldn’t see the end of the section, so with a deep breath you sat down and started a very long slide with water gushing down with you and kind of taking you along. Reaching the bottom was a bit of a relief but brilliant! Listening to my friends screaming and shouting in excitement as we took this in turn made me wonder why we hadn’t done this before! The morale between us was amazing and the adrenaline was pumping all the way. The pools and waterfalls just kept coming and and it was becoming apparent that the guides has something big up their sleeves to round the event off. Suddenly we found out what this was. We found ourselves standing at the top of a 30-foot waterfall next to a zip slide. Following the cable down we saw it headed down into a deep pool of water, tension suddenly grew as a few who had hidden their fear of heights somehow during the previous jumps suddenly weren’t so keen! A few went down and I soon found myself attached and jumping, wow what cool ride and even better with a cool splash down in to the water. It wasn’t long before everyone was persuaded by the guides to jump. A short walk back to the meeting spot and it was all over, but I think i’m right in saying that we all left there feeling satisfied with ourselves for completing the gorge and in many different respects. It was brilliant to test your courage against whatever nature throws at you – and get a real sense of achievement too. What a great way to explore a gorge, a hands-on approach which gives you the opportunity to get into the places you wouldn’t normally think of going, and some of them are stunning! The guides who took us down the gorge were very professional, friendly and direct which made things run smoothly and enjoyably. This is one of the best water based activities I have done for sure. 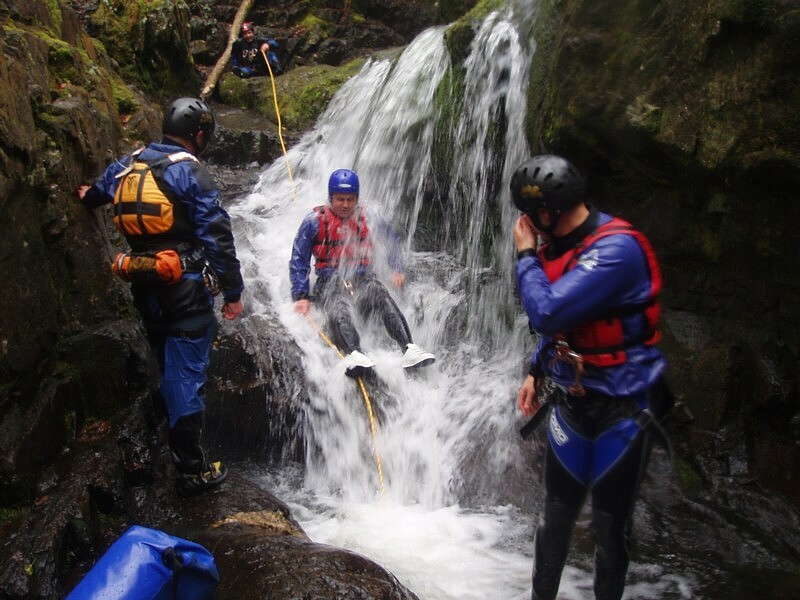 There are lots of centres and guides who run Canyoning in the UK, most of which can be found in the directory on this site. Go out Canyoning and explore the best mountain gorges have to offer!